Tips O' Mania - BESAN/CHICKPEA PANCAKES "CHILAS"
1. Mix Besan, Suji/semolina, Rice Flour, Turmeric, Salt & Ajwain/Carom Seeds in a big bowl. 3. Mix in Ginger, Cilantro, Green Chillies & Spring Onions (you may substitute with red onions instead & chopped 1/2 tomato). 4. Heat a skillet, drizzle some Oil for pan-frying. Allow it to get hot. 5. Add Baking Soda just before making the Pudas and mix well. 6. 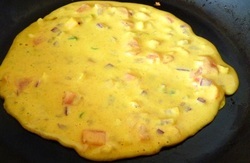 Spoon in some batter into the skillet and spread it in circular motion to thin it out in form of thin pancake, also spread out the veggies in it using your spoon. Drizzle drops of oil all around . 7. Allow it to cook for a couple of minutes (till the color changes) and make some indents with a spoon. Drizzle a little more Oil on the top and flip it. Allow it to cook on the other side as well. Remove once cooked on both sides. 8. Serve hot with Ketchup, Chutneys, Yogurt or Pickles. Make these super tasty, healthy veggie "cheelas" or Indian thin pancakes from chick pea flour, little semolina and rice flour for enhanced flavor & crispiness. Shalini Gupta says, add chopped spinach for health, also enhance flavor & appearance. Tried them and they turned out very tasty.